Animation is a solid genre to watch. You know you're going to get large helpings of humour, cuteness and colourful characters, all presented in visuals that will be called a mixture of 'lush' or at least, rather coldly, 'well produced'. Enjoyment is, by and large, guaranteed. 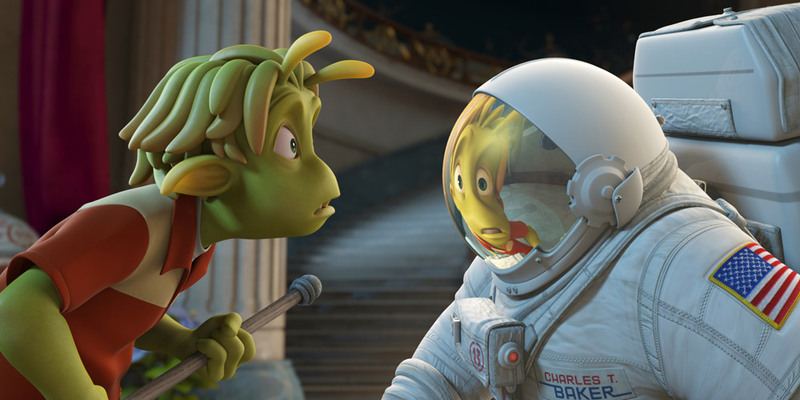 Only, in the case of Planet 51, it's not, this being the closest I've come to actually hating an animated film. In a flimsy script detailing astronaut Charles T. Baker's (Dwayne Johnson) trip to the alien-inhabited titular planet, there's never enough humour to have either adults or children giggling substantially and, more unforgivably, there's even less proper character development. Moments of slapstick comedy do register a few laughs but the clever smarts we're so used to in efforts such as Cloudy With A Chance Of Meatballs or Up (to name only last years best two animated films) are completely lacking. At times, the jumpy direction and editing manage to make the simplistic plot almost incoherent and Joe Stillman's script seems in a rush to get to the final confrontation with John Cleese's Professor Kipple and Gary Oldman's General Grawl, without any care for serious character development. Genuine moments of invention and nods to 'proper' science-fiction (the pet Alien is a highlight) are endearing but genuine warmth is really lacking, particularly towards the relationship between Baker and Lem (Justin Long) which never seems genuine. The feeling that you've been sold a dud is further confirmed by ill-judged, woefully performed, musical numbers by hippie-alien Glar (Alan Marriott), an attempt at a Bob Dillon-esque character for changing times whose semi-clever pop culture references don't add up to 'hit-the-spot' humour. A sad metaphor for the rest of film. Oh... the trailer was so cute. And so deceitful. I hate when they do that. Ha ha, yeah, it's very annoying. There is plenty of cute I suppose, but it's not enough to carry a film, certainly not one as thinly plotted as this.